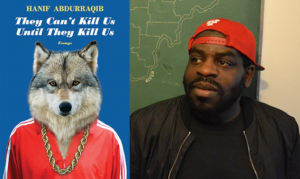 Hanif Abdurraqib reads from his new book of essays They Can’t Kill Us Until They Kill Us at the latest Paging Columbus event. This event was at publisher Two Dollar Radio’s new storefront location on Parsons Avenue, and the venue was packed. Abdurraqib was followed by William Evans, also launching a book (of poetry) Still Can’t Do My Daughter’s Hair, out from Button Poetry press.